Afrikmall is a place that Africans living in Colorado can call home, providing a range of business services, as well as cultural, community and social opportunities and events. There are many thousands of Africans living in Colorado, from Eritrea, Ethiopia, Ghana, Ivory Coast, Kenya, Nigeria, Senegal, Somalia, South Africa, Uganda, Zambia, and other African countries. Afrikmall will provide the best of African business, entertainment, products, services and cultural experience to the general public. This may include African restaurants and cuisine, a grocery store, a coffee shop, a beauty salon, art shops, clothing retailers and business office space, along with an event center and a cultural center. It is also envisioned that Afrikmall will also house a credit union or bank. Cobina Adu Lartson, Ph.D., is the CEO of Afrikmall, and also a science educator with Denver Public Schools; Edward K. Mensah is chief operating officer of Afrikmall and executive director of TMG Global; Albert K. Quartey is the chief financial officer of Afrikmall and also a supervisor with Unicircuit Inc.; Emmanuel K. Eliason is Afrikmall's chief business development officer, as well as the president and CEO of Eliason Consulting Group; Seth Assabil, Afrikmall’s chief of facilities, works in security. 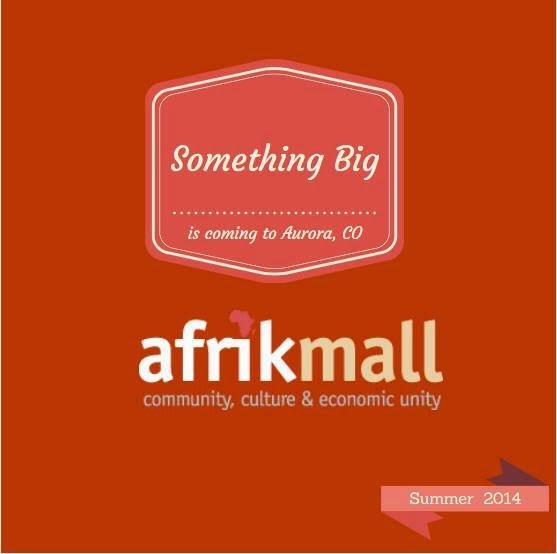 Afrikmall will be located at 10180 E. Colfax Ave. in Aurora, in a 56,281 square-foot building on three floors. Afrikmall, LLC, the management company overseeing Afrikmall operations, has a long-term lease on the property, which was purchased by 10180 E. Colfax, LLC, an ownership entity created by Colorado-based Northstar Commercial Partners. Why was that area selected? The Downtown Aurora location provides proximity to thousands of expected visitors to Afrikmall. Afrikmall is located within the Aurora Cultural Arts District on the Colfax corridor, in a radius that includes the Stapleton and Lowry developments, and the University of Colorado Anschutz Medical. A groundbreaking is expected soon, with remodeling in the spring and a grand opening expected in the Fall of 2014. For current update click here. Read the article which came out today in the Aurora Sentinel.